In the Acts of the Apostles we learn that Mark , the son of Maria, lived in Jerusalem during the early formative years of the Church. His mother was one of the first members of the Church, and it appears that she was a person of means. This can be assumed from the description of her home which was decorated with columns, and which had large facilities capable of receiving great numbers of the followers of Jesus (Acts 12.12). This is the same house where Peter met his other brethren, after being miraculously freed by the angel of God from jail, and where he baptised Mark into the new faith. Peter, in his first letter (A' Epistle 5:13) refers to Mark as his "son", although there is not any apparent relationship between them. In Colossians 4:10 it is shown that Mark was the "nephew of Barnabas", a Levite from Cyprus. The first direct mentioning of Mark is in the Acts 12:25. There, prior to the description of the first apostolic voyage of Paul and Barnabas, the two return to Antioch after delivering supplies sent by the Christian brethren to the Christians of Jerusalem. There with them was "John who is also called Mark". Given that the assistance had been sent at the time when the Emperor was Claudius Caesar, the trip of Mark to Antioch took place during the 15th or 16th year from the Resurrection of our Lord. A little later, directed by the Holy Spirit, Paul and Barnabas, taking with them Mark, arrive in Salamis, Cyprus, where after they cross the island arrive in the city of Paphos. There takes place the conversion to Christianity of the first Roman official, Sergius Paulus. Mark accompanied Paul and Barnabas in their second missionary journey, and again followed Barnabas when he visited Cyprus to teach about Christ. More information about Mark comes to us in the letters of St. Paul. Ten or twelve years later, as we read in the Epistle of Paul to the Colossians (4:10) and again in Philemon (6:24) Mark is with Peter in Rome, among the few who stood by the Apostle during those trying days. Orthodox ecclesiastical tradition has it that St Mark came to Alexandria in the year 42 and established the Church of Alexandria, and was its first bishop for 22 years. St Mark died the death of a martyr while he was being pulled through the streets of Alexandria by a pagan mob, and was buried in a nearby village. In the year 828 AD, Venetian merchants transported his relics to Venice, and since then he has been considered as the protector saint of this city. 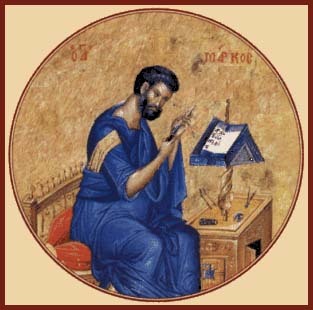 St Mark the Evangelist is commemorated in the Orthodox Church on 25th April. Text and graphics are from the Greek Orthodox Patriarchate of Alexandria website.